Imaging in plant cells and tissues suffers from limitations due to the complexity and high density of plant material. This is especially true for the application of super-resolution techniques. In STED microscopy e.g., high power depletion laser light is heavily absorbed by cell walls and chloroplasts leading to demolition of the sample, whereas structured illumination microscopy (SIM) can be restrained by bad signal-to-noise ratio. Deconvolution methods can help to overcome these limits and to gain resolution even in difficult samples like plant material. Here, we will present our experience at the Center for Advanced Imaging Duesseldorf gained in exemplary plant imaging projects using the HyVolution 2 extension in our SP8 confocal system. In these projects different types of plant tissues or cells were analyzed for subcellular localization, structure and dynamic behavior of fluorescent proteins in live-cell imaging. During image acquisition HyVolution 2 helped to increase resolution and signal to noise ratio and thereby facilitated downstream image processing and analysis. The dynamic assembly of messenger ribonucleoprotein complexes (mRNPs) underlies the various processes – e.g. transcription, transport and translation – of mRNA biogenesis. To understand these spatiotemporal changes in mRNP composition, we decided to undertake a high resolution microscopy approach: on a confocal microscope, we co-detect fluorescently tagged candidate proteins and the mRNA of interest using single molecule fluorescent in situ hybridization (smFISH). By measuring nearest neighbour distances, we estimate the degree of interaction between the candidate proteins and the mRNA within the intact specimen. 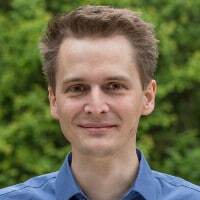 Such analysis revealed, for instance, that in the developing Drosophila egg-chambers, oskar mRNPs dynamically recruit kinesin-1 that transports oskar to the posterior pole of the oocyte. As oskar mRNPs concentrate locally – e.g. at the posterior pole – it becomes more and more difficult to resolve them individually. To overcome this limitation of light microscopy, we are now extending our method by superresolution microscopic techniques that enable 3D optical sectioning. 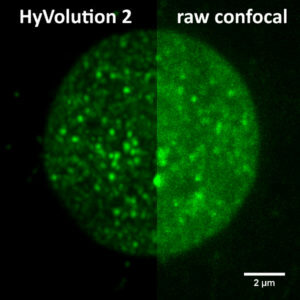 We have found that deconvolution and HyVolution improve the spatial resolution well while they remain gentle to the limited amount of fluorophores available in our samples.